• App switcher: switch between recent, last app, favorite app just by one gesture. 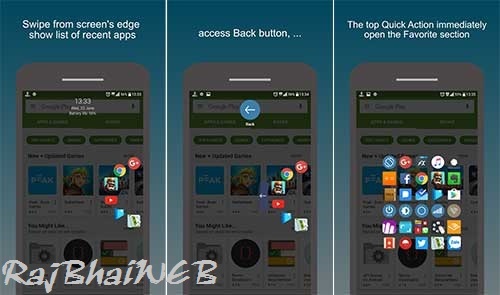 • Navigation bar: easily acces home button, back button and notification from edge screen. • Control panel: on/off wifi, bluetooth, rotation, screen brightness, volume,… within one gesture. • Direct call/sms: the fastest way to make phone call/sms to your favorite contact. • Unobtrusive: design as pie control pattern, it only appears when you want to. • FREE, no ads, no internet access, no root require.